One weekend in Kansas City is just not enough. In three days, Julia and I got the whirlwind tour of the arts community there – meeting artists, visiting spaces, and engaging in thoughtful conversations. 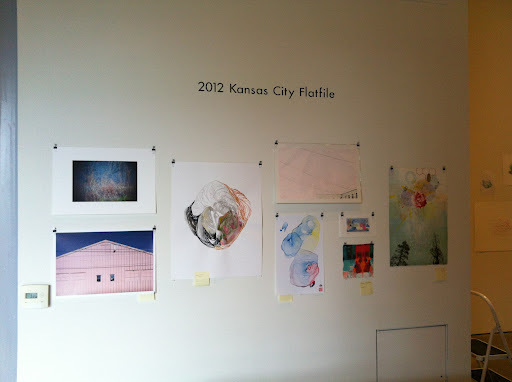 The Kansas City Flatfile exhibition at H&R Block Artspace. The work on this wall was selected by Kelsey Karper. 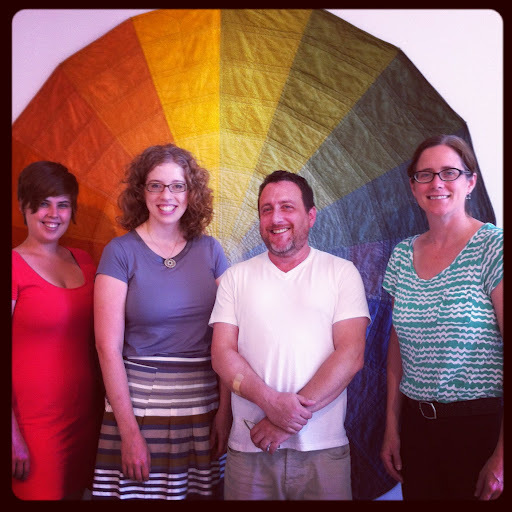 Our first stop was the H&R Block Artspace at the Kansas City Art Institute. Director and Chief Curator Raechell Smith invited us to each curate one wall of their annual Flatfile Exhibition. This was a great introduction to artists working in Kansas City, as there are around 200 artists represented in the flatfiles. 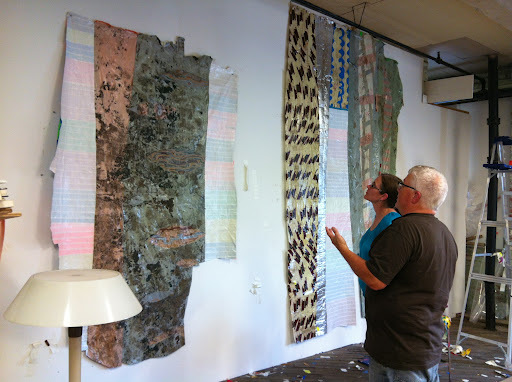 It was exciting to see fresh work up close, then to later get to meet some of the artists during the weekend’s events. 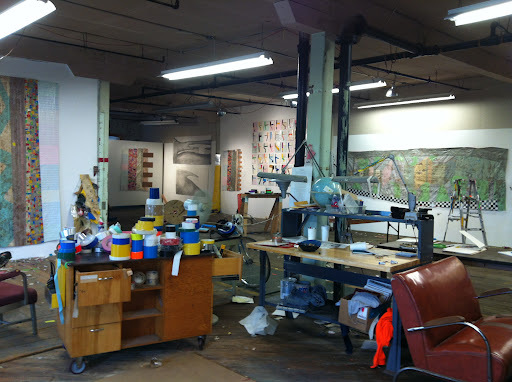 We were also thrilled to be invited to visit two artist’s studios at Studios Inc, a 51,000 square foot building in the Crossroads Arts District, which has been converted to studio space. The studios are offered free of charge to mid-career artists. 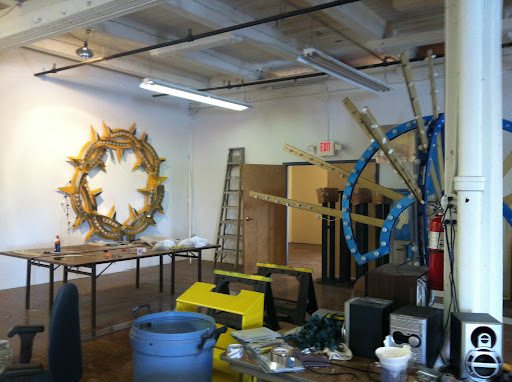 It also offers a wood shop, exhibition space, professional development, and networking. Julia Kirt and Garry Noland in his studio at Studios, Inc.
Our first studio visit was with Garry Noland. His large tapestry-like works are constructed primarily of multi-colored duct tape, though you probably wouldn’t realize it at first glance. The works are intricate and detailed, and other materials invariably make their way in – like texture from the studio floor or bits of National Geographic magazines. The studio of Dylan Mortimer, Studios, Inc.
We also visited the studio of Dylan Mortimer, whose clever works may go unnoticed if you aren’t paying attention. His “Road Signs” series combines official-looking street signs installed in public places with commentary about religion in the public realm. Though, his more recent works are little more difficult to miss, as they have become Las Vegas-style marquees, complete with glitter and lights. “Float” by Jarrett Mellenbruch, a public art installation for Avenue of the Arts. 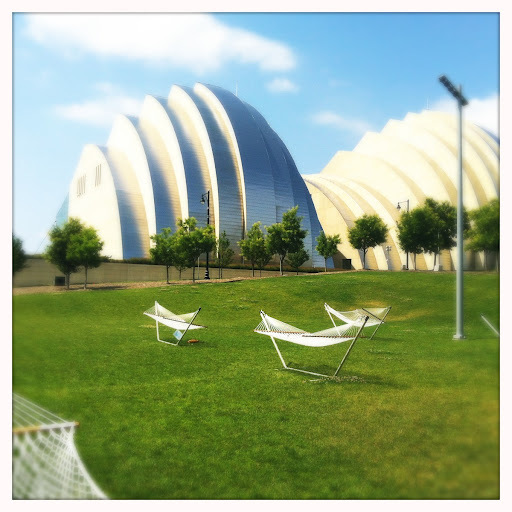 Background: Kauffman Center for the Performing Arts. Watch for more about our trip in an upcoming post from Julia. OVAC Associate Director Kelsey Karper & I have just returned from a jam-packed weekend in Kansas City, MO viewing art, visiting galleries and museums, chatting with artists and building on regional partnerships. We will post about specific spaces and conversations soon. Meanwhile, I wanted to reflect on some of the primary qualities that made the KCMO arts community so striking. First of all, the arts community rolls out the welcome. Everyone we met, whether planned or spontaneously, received us with enthusiasm and curiosity. From individual artists to commercial gallerists, they were excited to discuss their art activities and inquire about ours (along with a reasonable amount of OKC Thunder talk). Artists and other arts leaders express a pride in the city and the community’s art while simultaneously addressing the gaps and areas for improvement in their arts ecology candidly. This combination of acknowledging the strides already taken, while refusing to remain comfortably in the present, is exciting and healthy. I was especially inspired by their openness about aspirations for the community and for artists in their community. 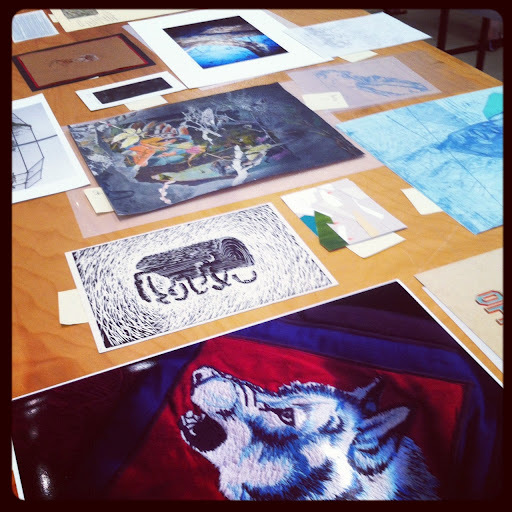 Are you involved with a visual artists’ group in Oklahoma? Please check out this list and let us know what’s missing! You can make a comment below or on our Facebook page. We develop this list as part of our annual Resource Guide we send to members. We know each year things change and there are many active artists groups in our state. Help us keep this comprehensive. We want to list any gathering, demo group, regular critique or the like that other visual artists may join. Canadian Valley Art Guild: Meet monthly at the Mabel C. Fry Library, Yukon on second Tuesday evening from September to May and organize exhibitions in the area. Duncan Art Guild: Monthly meetings, hands on workshops, etc. President Janice Kirksey, Celebration Frames, 1102 Oak, Duncan, OK 73533 or 580-252-7488. Red Earth Inc.: Exhibitions, artist workshops, and festivals focused on Native Americans www.redearth.org. FYI we also keep up listings for studio art classes, funding, and more… so if you have other ideas of new resources for artists in our state, feel free to comment.